Initially, they began with a 4-4-1-1 shape. Generally, Mesut Ozil was instructed to mark Xabi Alonso, but he would also have license to move away if the situation demanded. Alonso still got plenty of the ball in this phase as Ozil would often drift away depending on the position of the ball, but he would soon recover position. Ozil would often even be willing to press in Bayern’s own half, but Arsenal’s midfield duo behind him gave him no support in the press. Ozil holds his run well, closes the passing lane to the defender, and even pressures Alaba. Cazorla & Coquelin remain deep, leading to a free Bayern player (Vidal). The issue here is Sanchez’s positioning is too advanced, and Vidal has a free passing lane to the right side. This is not necessarily a bad thing. Ozil does very well to close the passing lane as well as close the man, and if he had players supporting his press then Arsenal could have won possession in this situation. But it seemed clear that Wenger had instructed his midfield to focus on remaining stable rather than forcing turnovers high up the pitch. This focus on horizontal compactness in midfield meant there was little space for Arturo Vidal & Thiago. Because of this, they often had success when drifting wide when Bayern were attempting to build play from the halfway line. 12:35: Vidal drifts very wide on the left, before receiving the ball with few passing options. 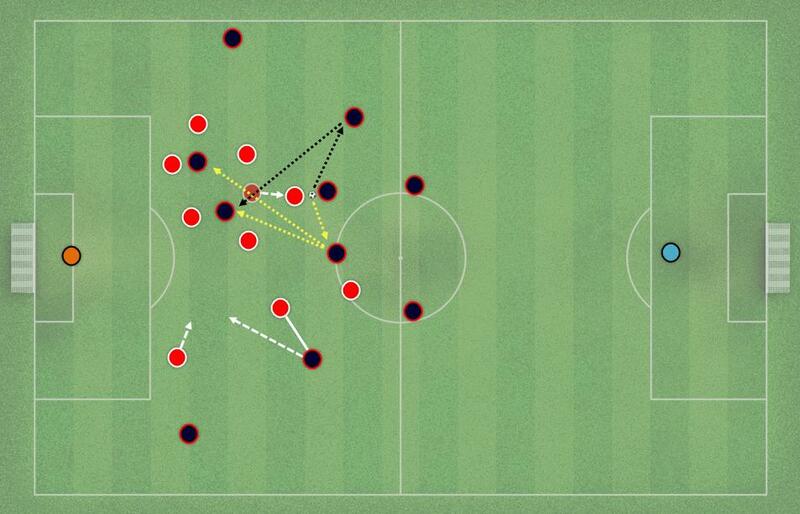 Ramsey presses quickly, leading to a recycle of possession through his backline. 12:49: Immediately after this sequence, Bayern attempt to move the ball to the right and this time Thiago has moved to the touchline. He drags his central midfield marker away in order to create space for Lahm to move into inside. This recycling of possession from side to side was aided by the shape of Bayern’s central defenders, particularly David Alaba. 17:16: Bayern have little opportunity for attack on the right, so try and circulate possession to the other side. Alaba steps forward to create an easy passing lane for Alonso to utilise, before immediately passing to Bernat. Creating such a quick tempo to the passing is a vital part of shifting Arsenal’s defensive shape and creating holes in the defense. 17:22: Indeed, a hole is created. Sanchez is again the culprit, and he is slow to shift laterally, meaning Thiago is able to receive the ball in a pocket of space. Monreal does well to half-press Thiago and slow the tempo, allowing Sanchez to recover position before Bayern can punish him. These subtle positional changes can make a big difference in allowing swift movement of the ball from left to right. During these 5-10 minutes, Bayern gained momentum. Ozil already seemed tired from his stringent defensive duties, and Alonso was finding space. At this point, Arsenal were not marking Alonso or maintaining the compact defensive shape they had planned. 22:40: there is a pocket of space in the left halfspace that Bayern can exploit. This has come about because Coquelin moved forward the pass before; Ozil seems to be struggling with his job of pressing in front of the midfield, and Coquelin attempts to cover. But this leaves space behind him, in which Costa & Lewandowski combine, before the ball eventually reaches Cech. It remains to be seen whether it was Wenger or Sanchez & Ozil who decided this change, but only minutes after this spell from Alonso, Ozil moved to the left flank of the 4-4-2, and Sanchez moved into the forward line. Arsenal also seemed to change this gameplan in regards to Alonso; they seemed happy to allow him to have the ball 30-35 yards from goal and let him try to play difficult passes over the defense. Whereas previously Coquelin had tried to press him when he was on the ball, now Arsenal seemed happy to allow him possession. Alonso has the ball in plenty of space. Arsenal are not bothered. There are no easy passes available, and even the difficult ones are well covered with good zonal coverage from Arsenal’s midfield or tracking of runs from the defense. The partnerships in defense are vital at this point — each player must communicate with the player next to them when there are that many attackers (look at how many Bayern players are in the ‘forward’ line!). Bellerin & Mertesacker communicate well, as do Koscielny & Monreal. The commentators often complained about the fact Arsenal allowed Alonso so much time. In fact, Alonso managed 100 passes in only 70 minutes. But he was unable to punish Arsenal. The reason this proved so successful in keeping Bayern out was because of the previously illustrated example; if they chose to press him, they would’ve left gaps for Bayern players to exploit. 40:51: an example illustrating the potential vulnerabilities if Arsenal did choose to press Alonso. If the CM pushed forward to close Alonso down, he may not be able to make an incisive pass, but Thiago (yellow) & Lahm (black) both provide immediate passing options. Either of these two players could then utilise the space created by the press, and play the ball into a dangerous area. Against a team like Bayern Munich, where each player is positioned so carefully, they are only ever one or two passes away from breaking the press and reaching the penalty box. Arsenal instead forced Bayern to rely on Alonso’s creativity and vision; and it paid off. Alonso is forced into a difficult pass to the onrushing Bernat. He is only able to receive the ball because of a lack of defensive awareness from Ramsey, who does not notice he is moving past him. But Bellerin shifts across and covers the situation well. This new defensive scheme was not always successful. Ozil is not a left-sided midfielder, and is often the key threat in offensive transitions. This means he can be slow to recover defensive position, as occurred only minutes after the Ozil/Sanchez switch. The left side is exposed as Ozil attempts to get back from a previous attack, and Bayern are able to get a shot from this area. But these lapses were not often, and also helped to create a fairly potent counter-attacking force. Ozil’s left-heavy positioning was useful in exposing faults in Bayern’s press & defensive schemes. This analysis has only focused on Arsenal’s defensive schemes, but much could also be said of their structure in attacking transitions. A combination of wonderful Santi Cazorla through-balls, great movement from Mesut Ozil to find space where there appears to be none (particularly in the left halfspace), and the pace of Walcott made Arsenal a constant threat in transition. Alexis Sanchez, despite often losing the ball in dangerous situations in his own half, also helped to create some big chances with his quick feet and press resistance. The lead up to that Neuer save came when he broke a forceful Bayern press. When you can get past that many players and get rid of the ball quickly, you’re often going to create good opportunities. This was an astute gameplan from Wenger, well carried out by the players. The only time Bayern particularly threatened was when Ozil tired, or there were individual defensive lapses from the wide midfielders (notably Sanchez & Ramsey). But forcing Bayern to play through Alonso forced them into becoming a one-dimensional threat, and often relying on 1v1 brilliance to break through. If Arsenal can repeat this kind of performance, they will surely be more of a threat to Europe’s elite than they have in the past few years. Great analysis, I’m happy to find this website. It was a great tactical affair. It was Wenger’s decision to move Ozil inside to the left of Mid-field – As he explained in the post match press conference. Pressing further forward was creating gaps. So he wanted Ozil to drop back and form a compact defensive shield. & yep, I’ve since heard that Wenger mentioned it in his presser. What great management.